If you need a little spring in your step, head to the kitchen with a bundle of fresh herbs and veggies and get going on this yummy recipe for Spring Garden Salad with Fresh Herbs. Bright colors of freshly cooked spring veggies and lovely textured herb leaves are enough to get anyone out of their winter funk for sure! This week I needed a little boost to wipe away the dreary weather blues, so I headed to my kitchen to make this gourmet spring salad. This salad involves several steps so it isn't a fast and furious recipe by any means. However, you can be sure the extra time will be well worth the effort when you see a gorgeous plate of spring color. This salad makes a perfect addition to the family dinner table for holidays, luncheons and more. I can't tell you how excited I am to be using culinary herbs in my kitchen again! Our greenhouse is loaded with lush herb plants here on the Belleville farm. And while it is still a little too chilly to plant them in the garden, I am enjoying herb plants on my windowsill until the temps warm up a bit. Instead of a large salad bowl, I usually reach for a large platter for this recipe. A platter shows off the colors and disperses the veggies nicely among the greens. Hard cooked eggs give a pop of yellow to the platter, asparagus and green beans add crunch and potatoes make it filling enough to be an entree. I like to top this salad off with a local cheese from Greenville, Illinois called Tomme. Tomme is similar to a cheddar-parmesan blend and it is aged for 12 months or more. If you aren't lucky enough to find this alpine-style cheese in your area, I recommend substituting Parmesan-Reggiano. Finally, drizzle the tangy dressing on top of the salad and you are ready to serve. I hope you will give this salad a try soon to add a little spring to your dinner table. I also hope to see you soon in our greenhouse. You will love the beautiful blooms and fresh herb and veggie plants. I just can't wait to get planting, how about you? Mix herbs and salad greens in a large bowl. Cover and refrigerate until ready to serve. Blanch green beans in about 1 quart of salted boiling water until tender, but firm about 6 to 8 minutes. Drain. Cover with cold water until cool. Drain well. Set aside. Line a rimmed baking pan with parchment paper. Brush tops and bottom of onions with oil. Place on baking sheet cut side down. Place cut potatoes in gallon food storage bag; add about 1 to 2 tablespoons oil. Toss to coat. 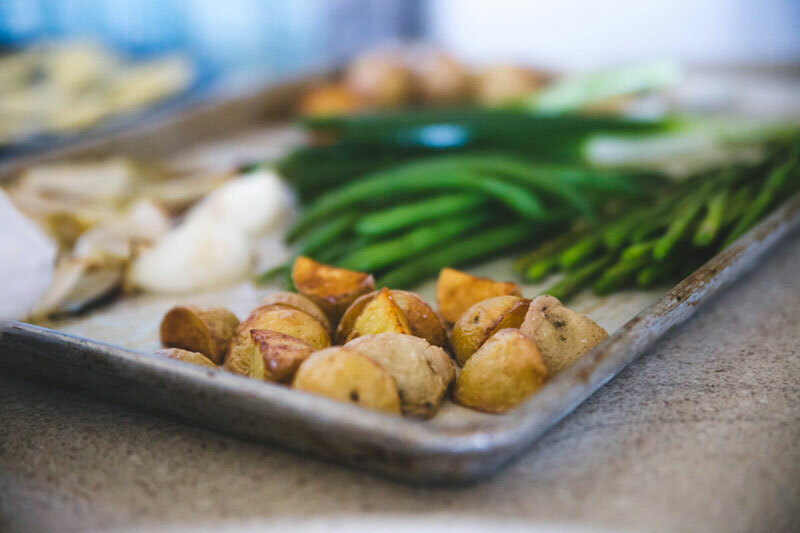 Shake off excess oil and place potatoes pieces in a single layer on baking sheet with the onions. Roast about 8 to 9 minutes. Toss asparagus spears in the same bag as potatoes, adding more oil if needed. Place spears on baking pan that is roasting the onions and potatoes. Continue to roast until all vegetables are slightly tender (2-4 minutes). Set veggies aside to cool for at least 15 minutes. When ready to serve, place mixed herbs and salad greens on large platter or shallow bowl. 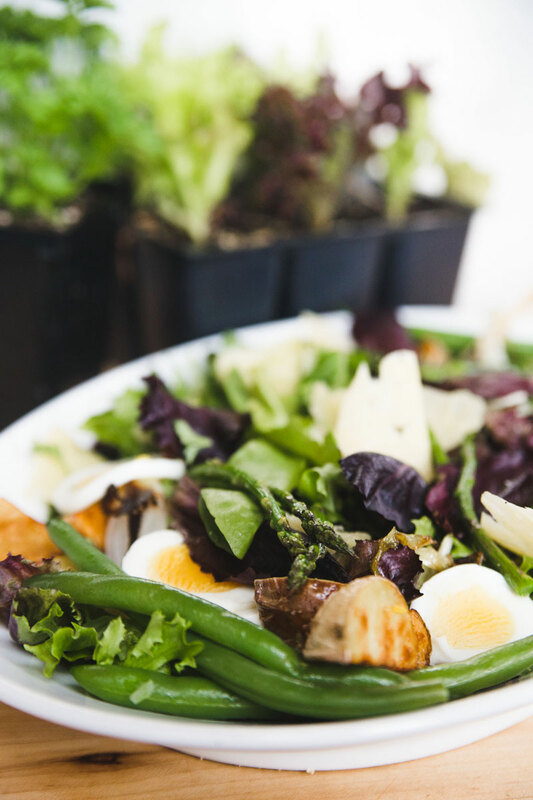 Arrange the egg slices, roasted green beans, spring onions, potatoes and asparagus spears on greens. Add the shaved cheese on top. Combine dressing ingredients to an 8-ounce canning jar with lid. Shake to blend. Taste; adjust seasoning if needed. Drizzle salad with dressing. Serve immediately. *Recipe tested with spears similar to pencil thickness. May need to roast longer if asparagus stalks are thicker. Makes 2 entree size salads or 4 side salad servings. Note: The roasted vegetables can be served at room temperature. If vegetables are roasted ahead of time, bring the vegetables to room temperature before serving. To plate ahead of time, reserve the shaved cheese and the dressing until just before serving.